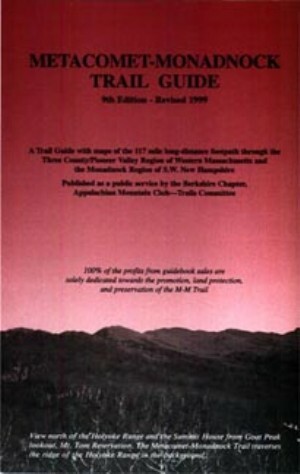 Metacomet-Monadnock Trail Guide, by Berkshire Chapter, Appalachian Mountain Club. 10th Edition, 2005. Authoritative guide to the footpath that runs 117 miles from northern CT through central MA and on to Mt. Monadnock. Detailed trail descriptions accompanied by page topo maps. 96 pp, 5 ½” x 8 ½”.